Background music loop (7-8 minutes in length) with a cue for the group to be dismissed. We used a solo guitar selection and added the sound of a person knocking on a wooden door as the cue. The prayer said before sharing communion is based on a traditional Seder prayer. Participants gather in a welcome room and are divided into groups of 10-12 persons. It’s important to experience this in a small group setting. 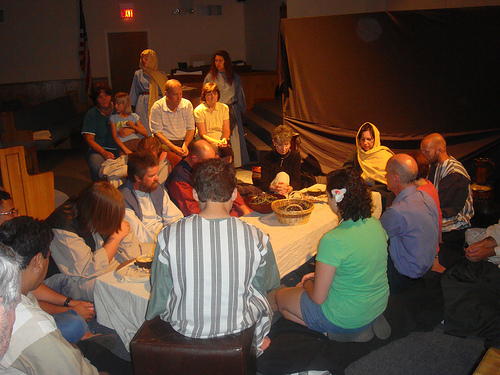 As participants leave this room and enter “the upper room”, they encounter “disciples” dressed in biblical garb standing and seated around the table. This could be all 11 disciples or a representative group. The disciples welcome the participants and encourage them to sit with them and between them around the table. “Servants” offer baskets of grapes and the “welcome plates” after everyone is seated, placing the trays and baskets on the table. The disciples adlib discussion appropriate to Biblical times with the guests for a few moments while everyone snacks. Welcome to the upper room. The story of Jesus’ passion begins here, at a meal with those who were closest to him. Many of our meals were happy occasions, but not this meal, not tonight. Jesus had many serious things he wanted to share with us. He knew his death was coming soon. 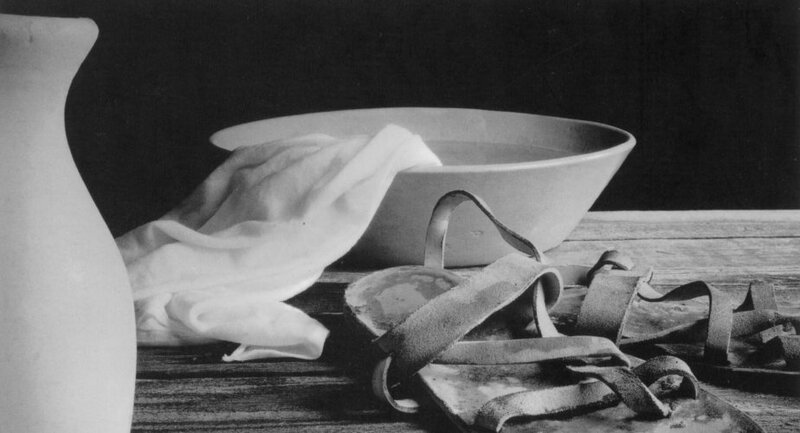 Jesus began by taking a bowl of water and a towel and washing our feet. We were very confused by this because this was usually done by a servant. 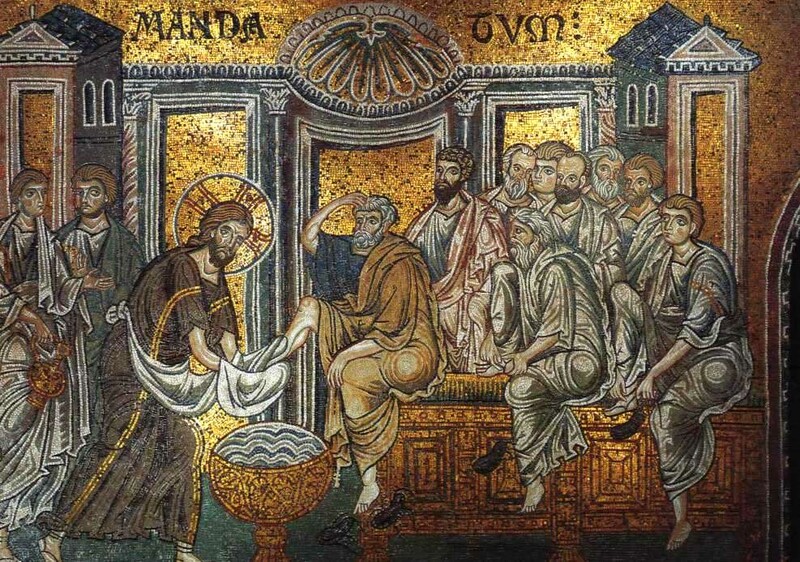 After Jesus washed our feet he told us to love one another and serve one another as he had just done. Pastor breaks a whole piece of pita in half. It is shared around the table till everyone has a piece. The pastor and other costumed participants hold their bread to encourage others to wait rather than eating it right away. “Drink from this all of you. This is my blood of the new covenant. 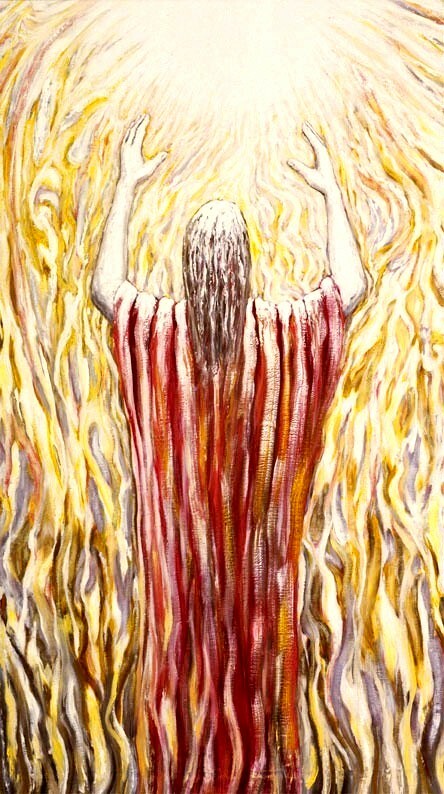 Poured out for you and for many for the forgiveness of sin. The Pastor dips his/her bread into the cup and then eats the bread to model communion by intinction for the others. The cups are passed around the table so everyone may participate. If persons are continuing on to another experience (ie Gethsemane), the Pastor or another disciple dismisses the group with the following. After this, they arose from the table and departed for Gethsemane. Go in peace. As people leave, words of blessing and peace are spoken by the disciples. The servants clear the table and refresh the food as needed. The water in the bowl is poured back into the pitcher to be used again with the next group. Upper Room Set, Sketch 1 designed by Nicole Sallee. We used the space between the front pews and the platform in our sanctuary as the location of the Upper Room. 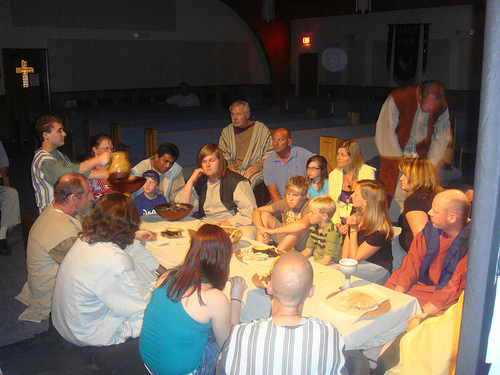 The Last Supper Experience was originally offered as the second of five interactive experiences in The Passion Week Experience, a walk through, Holy Week event conceived and written by members of the Worship Arts Ministry of Community United Methodist Church in DeBary, Florida. It would be equally effective as part of a series of prayer stations or other intimate worship experience.